Emory’s Integrated Core Facilities have announced a commercial agreement with HTG Molecular Diagnostics, Inc., to facilitate Emory researchers’ use of HTG’s EdgeSeq gene expression assays. This service allows scientists to determine levels of gene activity, for thousands of genes, in small amounts of material. 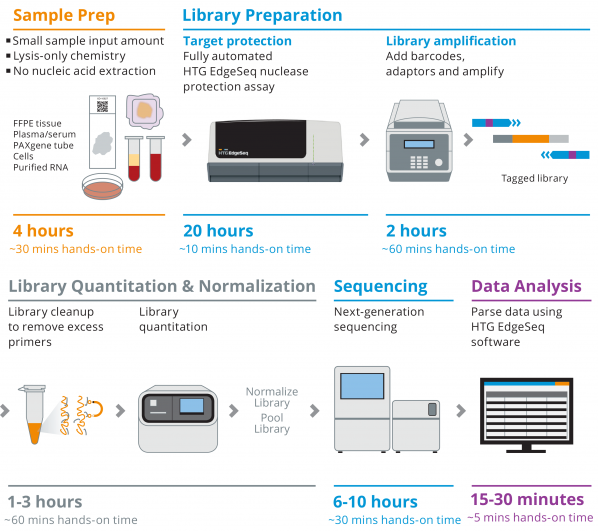 One convenient feature of this service is the ability of researchers to provide crude samples, without the need to extract nucleic acids, according to Ben Isett, manager at the Emory Integrated Genomics Core, one of the Emory Integrated Core Facilities. Samples can be provided to the core facility as plasma/serum, PAXgene stabilized whole blood, formalin-fixed paraffin-embedded (FFPE) tissue, or cell lines. A variety of standard panels are available, oriented toward oncology or whole transcriptome. Prices start at $500 per sample, and decrease to $$450 per sample for more than 50 samples, or $400 per sample for more than 100 samples. Data is provided in FASTQ format. Winship Cancer Institute members can get a 10 percent subsidy for eligible cancer-related projects. Labs at University of Georgia and other other Georgia Research Alliance-supported investigators are also able to use the service. More information is available at the Integrated Genomics Core website or by emailing EIGC@emory.edu.